I had visited the exhibition previosuly over the years. This time, the exhibition focused on the lives of thee major royal ladies: The Queen, Princess Margaret and Princess Diana. Over the years it has continually changed the royal dresses on exhibition. On display in glass cases were items belonging to those royal ladies: Dresses worn by the then Princess Elizabeth in the 1940's to her laser royal life as our Queen. Princess Margaret's scarfs, sunglasses and fur wrap to the iconic dresses from the 1950's to later life. Of course it also includes outfits famously worn by Princess Diana. From those featured in Mario Testino's photo-shoot, to her state visits. For me, it was like looking through the pages of a picture book. Outfits that jumped from the pages into real life. 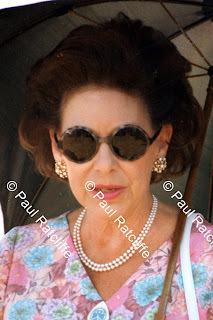 The one shouldered Pink Sequned Dress she wore to her visit in Brazil in the early 1990's stood out for me. You can look closely at the details and all the work that went into making each couture piece. over the years as well. All included in the price of admission to Kensington Palace! Lovely photos, I am interested to see that they change the dresses around because the blue one next to Diana's green was not here when I went nor was Diana's cream lacy dress. Just proves you need to go a few times!